The built-in Bosch WKD28351GB reliably washes your laundry and gently dries it to exactly the degree of dryness you want. 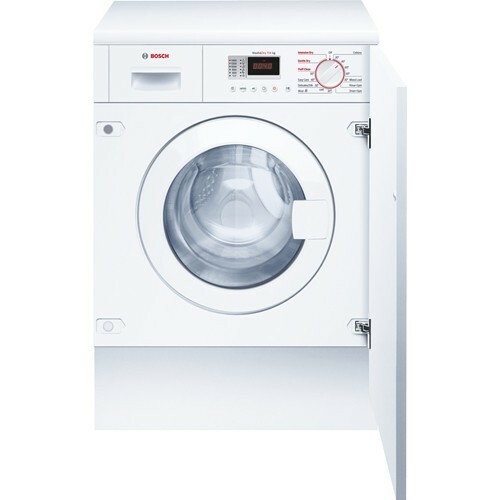 It has a 7kg load and a 1400rpm spin, with a Flexi time option that reduces wash times by up to 30% in two steps. You can dry up to 4kg with 2 heat levels available – normal and delicate. There are 15 programmes including dedicated cycles for handwash woollens and delicates, plus a mixed load wash at 30ºC. Thanks to the delay timer you can take advantage of your energy supplier’s cheaper tariffs, and there’s a selectable prewash option as well as a reduced ironing button. With manual 20-150 minute timer and fluff removal cycle. Operation of the WKD28351GB Washer Dryer is easy and intuitive, with a large LED display to guide you and a control dial for special programme and wash selection.